Aerial View of Terminal, Looking North: Figure 2 in Frederic R. Harris, Inc., Report on Piers and Industrial Property of the Bush Terminal Company. With a thriving immigrant population, extensive waterfront access, and proximity to Manhattan, Brooklyn's Sunset Park became a booming center of industry at the turn of the 19th century. Anchored by the Bush Terminal, a massive complex of factories, warehouses, rail and shipping links, Sunset Park(???) was built in stages from 1895-1925 by the wealthy businessman Irving T. Bush on the former site of his family's oil refinery. 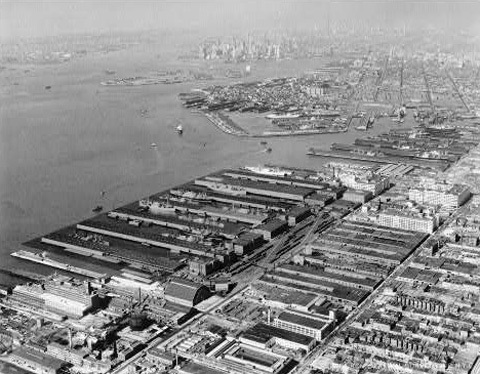 Bush conceived an intermodal transportation, warehousing, and manufacturing facility as a challenge to Manhattan's primacy, convincing railroad officials to establish direct routes to his Brooklyn piers via "car floats" that ferried railroad freight cars across the harbor. The first section of the complex was a brick-clad concrete frame building designed by Kirby, Petit & Green in 1895 and built by Turner Construction as the largest reinforced concrete structure in the U.S. at the time. A series of six-story factory lofts, also built in reinforced concrete from 1904-1918, included courtyard access to rail sidings and maximum window space. Ultimately, Bush Terminal became America's largest multi-tenant industrial property and the first industrial park, spanning across twenty waterfront blocks and eight piers, with 118 warehouses and twenty-six factory buildings where more than 25,000 people were employed. Bush touted an advanced elevator system, which gave tenants direct access to the freight trains arriving at the site. He also built worker housing, developing Sunset Park as a "factory city" for 30,000 people. The complex currently owned by the city with space leased to manufacturers and artists, in what is called Industry City.